Allows coaches with 50A locking service to connect to 15A household power. Didn't need the pigtail. Didn't think l needed the pilot light but it turns out to be very helpful to let you know the power is on. I use my fifth wheel for work and personal pleasure. When I store it between trips, I would have to drag out the huge 50 amp cord with mulitple adapters to plug it into a standard 15 amp receptacle to maintain my batteries. 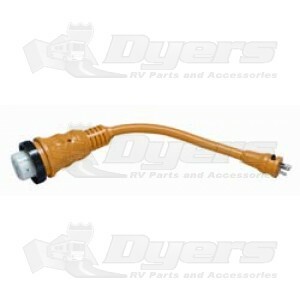 This product is perfect, it goes into the 50 amp shore plug on my fifth wheel where I can use a standard extension cord to maintain the batteries. It doesn't take up much room in my storage compartment, it is well made and a lot easier to deal with.